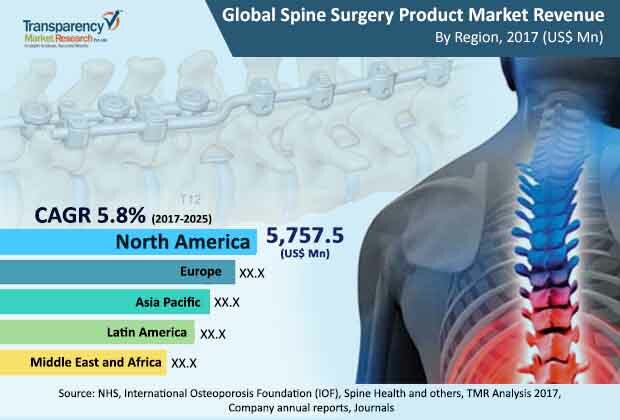 The global spine surgery products market is expected in a report by Transparency Market Research (TMR) to find companies focusing on mergers and acquisitions, expansion of regional footprint, and diversification of product portfolio to stay in a strong position. Presence of several high-impact players could raise the level of competition in the market. New aspirants are foreseen to come across favorable opportunities for entering the market. Looking at the intensifying nature of competition, players are observed to invest more in research and development to stay afloat when operating in the market. Furthermore, there could be a high focus on innovation. TMR prophesies the global spine surgery products market to rise at a 5.8% CAGR during the forecast period 2017-2025 to touch a valuation of US$16.7 bn by the final forecast year. In 2016, the market was valued at a US$10.2 bn. In the same year, fusion product secured a higher share of the market, and is forecasted to continue leading the market in the coming years. By region, North America could be in charge of the market with regard to revenue generation. The world spine surgery products market is foretold to become popular with rising accidental cases involving spinal injuries among young adults. Since geriatrics are more likely to face spinal disorders and undergo spinal surgeries, increase in their population could be another factor helping the market to take the center stage. In the near future, the market is envisioned to accelerate growth on the back of spinal surgery recommendations given to patients and several technological developments in the field. For instance, minimally invasive surgeries are on the rise in North America for serious disorders such as adolescent idiopathic scoliosis (AIS). Seasoned analysts project the international spine surgery products market to grow well in the foreseeable future. However, there could be a few market restraints troubling growth during the course of the forecast period. For instance, lengthy product approvals and clinical trial failures of several spinal surgery products are envisaged to cut short the demand in the market. Nonetheless, players could cash in on some lucrative prospects still available in the international spine surgery products market. Improved healthcare infrastructure in Canada, promising reimbursement policies, and increased adoption for diagnosing and treating different types of spinal disorders are anticipated to create a wealth of opportunities in North America. In Europe, expansion of insurance coverage and rising prevalence of chronic diseases leading to increasing number of spinal surgeries could improve demand in the market.